How to View your Friends Upcoming Birthdays on Facebook: Facebook is the largest social networking website built for friendships or relationship purposes. When people signup accounts, Facebook required them to enter their date of birth automatically. Once that day comes up, friends of the person are always asked to wish the person a happy birthday on Facebook. Interestingly, how to find birthdays on Facebook is what really called for this article. How to find birthdays on Facebook is what really called for this article. 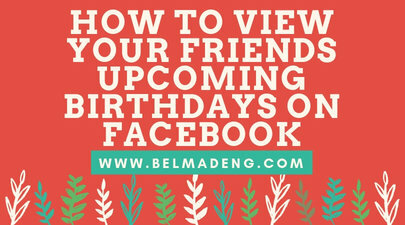 So if you're looking for the step-by-step guides on how to see your friends upcoming birthdays on Facebook, this post got you covered. 1. From your homepage, click Events on the left side. 2. Click Birthdays on the left side. Today's Birthdays will appear at the top. 3. Scroll down to see Recent Birthdays and Upcoming Birthdays. To see a specific friend's birthday: 1. Go to your friend's profile. 1. Tap the three-horizontal-stroke-lines icon and then tap Events. 2. Tap Calendar at the top. 3. Scroll down to Basic Info.